This article is a short summary of Super Mario Bros..
North American boxart for Super Mario Bros.
Super Mario Bros. is a platformer video game originally released for the Nintendo Entertainment System in 1985. It was one of the seventeen initial launch titles for the system, as part of the Action Series. Bundled with releases of the console, it is commonly cited as the biggest factor for saving the North American video game market after the market crash in 1983. 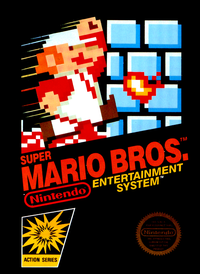 Super Mario Bros. would receive several follow-ups, becoming the first game in the mainline Super Mario series. Super Mario Bros. sold over 40 million units, making it the best-selling video game of all time for a single platform until the release of Wii Sports in 2006, and the best-selling Super Mario game ever released. One day, the king of the Koopas Bowser invades the peaceful Mushroom Kingdom and turns the inhabitants into stones, bricks and plants. The only one who is able to undo the black magic of the Koopas is Princess Toadstool, who was captured by Bowser and imprisons her in the last of his eight castles. The Mario Bros. hear about what happened and set out to free the princess, defeat Bowser and restore order to the Mushroom Kingdom. Super Mario Bros. is a 2D sidescrolling platform game, in which players play as Mario to traverse through levels by running or jumping. The object of each stage is to get to the flagpole at the end and clear the level. The game features eight worlds with four stages each, ending with a boss battle with a fake Bowser and Toad stating that the princess isn't in the castle. Throughout the game are blocks, which when hit give players items such as coins and power-ups, which allow Mario to grow in size and take more than one hit. The game also features a rotational two-player mode in which the second player controls Luigi, competing with the first player to reach the end first and earn a higher score. When one player loses a life, the second player can play from the stage they are on. As one of Nintendo's most popular and well-known video games, Super Mario Bros. has been ported numerous times since its original release. Super Mario Bros. Arcade (Nintendo PlayChoice-10) 1985 A direct port of Super Mario Bros. released for arcades. Famicom Disk System 1986 A direct port of the game for the Famicom Disk System. VS. Super Mario Bros. Arcade (Nintendo VS. System) 1986 An alternate version of the game released for arcades. Slightly altered stages, and some completely different stages (some of which would be used for Super Mario Bros.: The Lost Levels). Famicom Disk System 1986 A retooled version of Super Mario Bros., using graphics from Super Mario Bros.: The Lost Levels and replacing various graphics with sprites based on elements and celebrities from the radio program All Night Nippon. This version of the game was distributed as a raffle prize on the program itself. NES 1988 A compilation cartridge containing both Super Mario Bros. and Duck Hunt, released with the NES Action Set bundle in 1988. Super Mario Bros./Tetris/Nintendo World Cup NES 1988 A compilation cartridge released exclusively in Europe, featuring Super Mario Bros., Tetris, and Nintendo World Cup. The game was released both standalone and in a bundle with model NES-101 system. NES 1989 A compilation cartridge released with the NES Power Set bundle, featuring Super Mario Bros., Duck Hunt, and World Class Track Meet. NES 1990 A competition cartridge featuring altered versions of Super Mario Bros., Rad Racer, and Tetris. The Super Mario Bros. portion of the game ends after collecting 50 coins. A compilation of remakes of the first four Super Mario Bros. games (Super Mario All-Stars + Super Mario World featuring Super Mario World in addition), featuring updated graphics, sound, and programming. 2000 (JP) A Game Boy Color port of both Super Mario Bros. and Super Mario Bros.: The Lost Levels, including various additional features. Game Boy Advance 2004 A direct port of Super Mario Bros., released as part of the Classic NES Series for the Game Boy Advance. 2008 (KR) A direct port of the game, released as a digital download for Wii. Wii 2008 A direct port of the game is included as a Masterpiece, as a 1:00 timed demo. Wii 2010 A direct port of Super Mario All-Stars for the SNES. Super Mario Bros. 25th Anniversary Edition Wii (Virtual Console) 2010 A direct port of the original game, replacing the original ? Block graphic with blocks featuring a "25" on them. This version of the game was released exclusively with certain Super Mario Bros. 25th Anniversary Wii bundles. Full release: 2012 A direct port of the original game; originally released exclusively as part of the Nintendo 3DS Ambassador Program before being released to the public with Virtual Console features in 2012. Wii U (Virtual Console) 2013 A direct port of the original game with added Virtual Console emulator features. Wii U 2014 Titled "Super Luigi Bros.", a mirrored version of the original game with Luigi as the main character instead of Mario. Wii U 2014 A direct port of the game is included as a Masterpiece, as a 3:00 timed demo. Nintendo 3DS 2014 Titled "Super Speed Bros.", a sped-up version of the original game. AUS: May 1, 2015 amiibo tap: Nintendo's Greatest Bits includes a direct port of Super Mario Bros. that allows players to play timed demos of various scenes in the game. Super Mario Bros. includes nine scenes. Nintendo Entertainment System: NES Classic Edition 2016 A direct port of Super Mario Bros. included as one of the games pre-loaded onto the system. ↑ NES games list by Nintendo. Retrieved December 2, 2016. This page was last edited on 11 February 2017, at 23:15.